4 Bedrooms, 2 1/2 Bathrooms, 2 Car Garage with Storage Space, and Covered Front Porch. This spacious design is perfect for a growing family. It features main floor mudroom, family room with fireplace, and rec room. 9' ceilings throughout the main floor, with 18' ceiling in the foyer. Kitchen includes large island, raised breakfast bar, and pantry. Bay area in dining room with plenty of windows for natural lighting. Arch entries into both the rec room and dining room. Main floor office. Two story foyer with open staircase to second floor and balcony. Master suite includes his & her closets with custom built shelving and organizers. Double vanity & powder desk in master bath, and walk-in tile shower with dual shower heads. Second floor laundry room. 3 bedrooms, 2 1/2 bathrooms, 2 car garage, with covered front porch. Main floor laundry room. Open concept kitchen, dinette, and great room. Fireplace in great room. Open, two story foyer with second floor balcony. Jetted tub in master bathroom. 4 bedrooms, 2 1/2 baths, 4 car garage, with covered front porch. Main floor laundry room. Open concept kitchen (including pantry), breakfast bar, dinette, sunroom, and living room. Fireplace in living room. Master bathroom includes double vanities, window for natural lighting, linen closet, pocket doors leading into walk-in closet. Optional finished rec room in the basement, with 1/2 bathroom and utility room for extra storage. 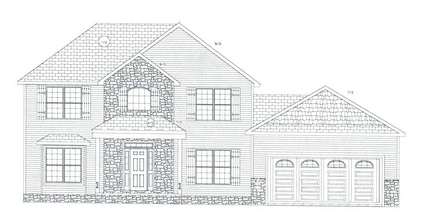 4 bedrooms, 2 1/2 bathrooms, 3 car side-load garage, with covered front & back porch. This spacious design includes a large, open concept kitchen with custom pantry, dinette, and great room, with large formal foyer, grand staircase leading to second floor, and den. Great room features two story ceiling and fireplace. Main floor master bedroom includes tray ceiling and large walk-in closet. Linen closet, double vanities, stand-up shower, and jetted tub in master bathroom. Three bedrooms on second floor with full bathroom. 4 bedrooms, 2 1/2 bathrooms, 2 car garage (with extra storage and work bench area). Main floor laundry room. Large, walk-in pantry with custom built-in storage. Open concept kitchen with large bar, dinette, and formal dining room with arch entryway. Fireplace in family room, with vaulted ceiling and many windows for natural lighting. Open, two story foyer with grand staircase leading to second floor. French doors leading into den. Spacious main floor master suite. Master bathroom features large walk-in closet, double vanities, jetted tub, and custom built-in tile shower with dual shower heads and stone bench. Balcony on second floor overlooks both foyer and family room. Three bedrooms on second floor with full bathroom.